There is sometimes confusion between the communication techniques used with deafness versus blindness, especially with understanding what Braille is and who uses it. It's not uncommon to tell someone you know sign language and then they ask if you know Braille. Braille is typically not used by deaf or hard of hearing individuals. It is a written language used by the blind and visually impaired who may have a hard time, or be unable to, read written text. Braille uses patterns of raised dots to represent the characters of words. Instead of using sight to read text, the fingertips are used to feel the pattern of the raised dots to read Braille. Similar to how there are different types of sign language, there are different versions of Braille. The United States uses English Braille. Even within English Braille there are different levels of encoding, similar to how there are different reading levels for English text. Braille usage has declined because of the increased availability and use of screen reading software. However, braille education remains important for developing reading skills - in addition to physical books and other texts, Braille can be found in all types of locations from signs in public areas to in elevators. For example, see the Braille under the number 12 located next to the elevator button in the photo. For more information on Braille, see the Braille Wikipedia page. We also have a previous Signing Savvy blog article, The mysterious confusion between deafness and blindness, that you may be interested in. This week is Deaf Awareness Week! This week, September 24th to 30th, is Deaf Awareness Week. Deaf Awareness Week, also called International Week of the Deaf (IWD), is celebrated annually and ends with International Day of the Deaf on the last Sunday of the week. Deaf Awareness Week is celebrated by national and regional associations of the deaf, local communities, and individuals worldwide. The purpose of Deaf Awareness Week is to increase public awareness of deaf issues, people, and culture. Activities and events throughout Deaf Awareness Week encourage individuals to come together as a community for both educational events and celebrations. Help promote the beautiful language of the Deaf and Hard of Hearing by learning a special something and sharing it with others out there who may not know sign language. You can use Signing Savvy to lookup and pick out signs to learn and share. Also, visit the site each day the rest of the week to see the sign of the day, which have to do with Deaf Awareness Week (we've chosen the signs for deaf, hard of hearing, education, proud, community, and celebrate). Volunteer to sign a children’s book for story hour at your local school or library. Educate a co-worker or neighbor about Deaf Awareness Week. Tell them it’s Deaf Awareness Week and share a fact with them – anything from a statistic, misconception, or success story to showing them how to sign something. For more information on the history, purpose, and types of events that occur during Deaf Awareness Week, see our Deaf Awareness Week page. Signing Savvy is a great resource to use when learning sign language – whether you are taking a class or just trying to learn on your own. When you are taking a class, you can use Signing Savvy as a sign reference, build your own wordlists related to what you are learning in the class, and practice your vocabulary using the flash cards and quizzing features. Like using a textbook, Signing Savvy is a great companion to classroom learning. At about the same cost of a textbook, our site currently features more than five thousand signs – that’s about three times the number of signs in most sign language books. But Signing Savvy isn’t a textbook and is so much more than just a sign language dictionary, the site is always changing… we’re always adding more signs, content, and features. 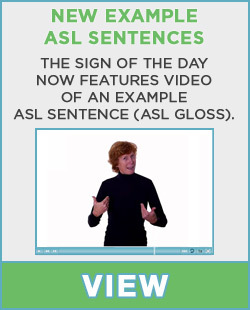 It’s really the features of the website, not just the vocabulary, that help people practice and learn sign language. Teachers that use Signing Savvy will often create wordlists for each lesson plan or for the week’s vocabulary and then share those wordlists with their students so that they can use the Signing Savvy wordlists they have created to practice and test themselves with flash cards and quizzing. Teachers with younger students will often share the wordlists they’ve created with their student’s parents as well, so the parents can know what is being taught and try to learn the sign language vocabulary along with their child and help them practice it at home. Students and/or parents can also try to incorporate the signs from the current lesson’s wordlist into their activities and discussion for the week. Utilizing Signing Savvy’s wordlists, flash cards, and quizzing features is a great way to practice vocabulary and extend lessons from the classroom into the home. Signing Savvy users include people from all backgrounds and people interested in sign language for all types of reasons – from parents, friends, family, and neighbors of someone that uses sign language to communicate to students interested in learning a new language, those that have or are beginning to experience hearing loss, those that are deaf and hard of hearing, parents teaching their baby and young children sign language, people who sign songs and sign in church, teachers, interpreters, and more. The way that most people use Signing Savvy to learn sign language is by creating wordlists and viewing wordlists created by others and then using the flash card and quizzing features to practice and test themselves. Full membership lets you have unlimited access to all of the Signing Savvy features including wordlists, flash cards, quizzing and more. Start with the pre-built wordlists that we have (you can see some of our pre-built wordlists at the top of every page next to the search box, where it says "browse signs by..."). Test yourself on each of the wordlists using the flash card or quizzing features. Sign Language books are often organized into chapters by topics, such as numbers, colors, and animals. Using the Signing Savvy pre-built wordlists is similar to studying the vocabulary in a chapter of a sign language textbook. Create a word list of words you want to start learning. There may be a specific topic that you’re interested in learning vocabulary for or there may be certain words that you find you would like to be able to sign regularly. Signing Savvy gives you the flexibility to create your own custom wordlist. After you have built your wordlist(s), use the flash card or quizzing feature to test yourself on those words. View wordlists already created by other people and test your self on those words using the flash card or quizzing feature. You can view all wordlists that other Signing Savvy members have created and made public by clicking on the "Shared Lists" button, which is just under the "browser signs by..." box. There are thousand of wordlists that you can browse and search. For example, if you want to learn signs related to behavior, just type “behavior” in the search box on the shared wordlist page and click “Search for list”. It results with several lists from you to choose from, including wordlists about behavior and manners (that is just one example). Once you’ve found a wordlist that you would like to use, you can bookmark it so you can easily find it again and use the flash cards or quizzing features with the list. Additionally, any sign or list of signs can be printed if you want to print signs, create a hardcopy of flash cards, or paste printed signs into story books or art projects. What was our favorite part of the Opening Ceremony for the London 2012 Olympic Games? It had to be the Kaos Signing Choir for deaf and hearing children and Deaf Percussionist Evelyn Glennie. If you saw the opening ceremony for the 2012 Olympic Games, you probably caught the children in pajamas singing and signing the British national anthem, "God Save the Queen." The children were from the Kaos Signing Choir for deaf and hearing children - the only integrated deaf and hearing children's choir in Britain. 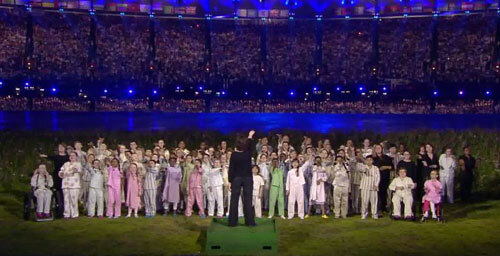 The choir includes 200 children from 4 to 18 years old, both deaf and hearing children who sing and sign together. The children's choir, from North London, signs in British Sign Language (BSL). Note: British Sign Language (BSL) and American Sign Language (ASL) are different forms of sign language and use different signs. What you may not have realized watching the opening ceremony was that the lead percussionist has been profoundly deaf since the age of 11. 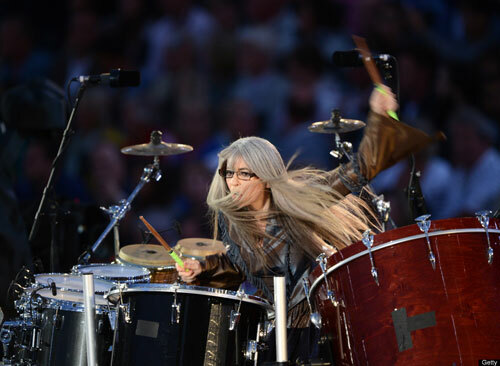 Award-winning Dame Evelyn Glennie, arguably one of the best percussionists in the world, was born in Scotland and plays internationally. She owns over 1800 percussion instruments from all over the world and also plays the Great Highland Bagpipe. Glennie believes that "Deafness is poorly understood in general. For instance, there is a common misconception that deaf people live in a world of silence." She says, "Deafness does not mean that you can't hear, only that there is something wrong with the ears." She explains that hearing is a specialized form of touch that includes hearing sounds, feeling vibrations, and seeing items move and vibrate. She uses parts of her body, other than her ears, to hear. She detects vibrations and has learned to distinguish notes by where on the body she feels the sound and how thick the air feels - low sounds she feels mainly in her legs and feet, while she feels high sounds on her face, neck and chest. She also observes how items move to detect sound. She often plays barefoot in order to feel the music better. To hear music by the talented Evelyn Glennie, you can find her CDs on Amazon, such as Her Greatest Hits. To learn more about Evelyn Glennie, watch the documentary about her: Touch the Sound - A Sound Journey With Evelyn Glennie. A perspective on deaf education: Dr. Joseph Valente's "Hearing the Unheard"
Our recent blog article on Education Options for Children that are Deaf or Hard of Hearing covered the various educational options available. We did not specify any one option as being "the best" option because every child, family, and situation is different and education is a very personal decision. However, one of our suggestions was to connect with deaf adults who can provide advice based on their own education experience. We found a TEDx video by Dr. Joseph Valente that talks about his education experience. With the slogan "Ideas worth spreading," TED is an event where speakers share their thoughts on a variety of topics. Dr. Valente's talk was at a TEDx event locally run by Penn State University. Dr. Valente is deaf and touches on his experience being mainstreamed. He discusses how deaf and hard of hearing students aren't disabled and shouldn't be in special education; they are bilingual and need a bilingual education. He feels deaf schools are great for students because they use both spoken language and signed language. He also talks about not meeting other deaf or hard of hearing students as a child and feeling alone. He believes deaf schools are great in socializing students and exposing them to Deaf culture. NOTE ON CAPTIONS: We wish this video was available with a view of the interpreter, but at least full captions are available. If you aren't seeing the captions, scroll onto the video, click the "CC" and then select to turn the captions on. I love the video! That is the point I've been trying to get across for years. I want to suggest adding links to easily post on Facebook and share so that our education efforts will be a bit more widespread. Facebook, Twitter, MySpace, etc. are very heavily trafficked areas, which is why I want to add this modul. inspirational is wat it is... i love stories... showed me a new perspective on life.